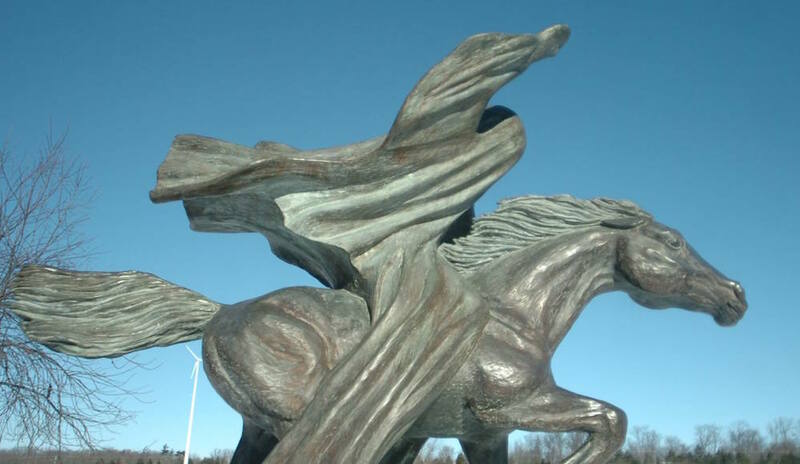 The Kaukauna Galloping Ghost statue in front of Kaukauna Area High School. KCN photo. KAUKAUNA — BuzzFeed, the viral news and culture site, is known for its endless use of lists — that’s because they are addicting and hard to pass by. The origin of the term “Galloping Ghost” as now used in conjunction with Kaukauna High School athletic teams and students started in the early 1920s. A sports writer for a local paper promoted the name of “Ghosts” for Kaukauna’s football team in one of the articles he wrote. The writer had predicted a Kaukauna win over the Appleton Terrors based on the fact that Kaukauna was lighter and would trample Appleton with our speed. This game was played on Halloween and Kaukauna was dressed all in white–looking like a large group of ghosts as we galloped over Appleton. In many article written during this time, we were know for our great speed, which accounted for many victories. We were referred to as “Galloping Ghosts” and also “Tigers” and Kaws”. The galloping horse and its rider came into the ghost story 20 years later when those attending home football games witnessed the presenting of the game ball to the referee by a sheet-clad rider and galloping horse. The students, faculty and others in those days past who were involved in the planning and execution of both the name and the phantom horse had a great time. Those memories to many alumni are priceless and a part of our heritage, as well as our high school’s since 1925. The Kaukauna High School sports’ mascot, ”Galloping Ghost”, evolved from an interesting history of athletic events and competitors beginning with the legendary Harold ”Red” Grange. Red was a three-time All American halfback who played for the University of Illinois during the early 1920’s. Following his college competition Grange played football professionally for the Chicago Bears and the New York Yankees. He was fast and elusive, difficult to catch – ghostly! Red’s success on the gridiron earned him the nick name, The Galloping Ghost. average (but speedy) running backs to emulate Red Grange’s goals and accomplishments. In an article in the Kaukauna Times dated 1926 November 11 the following quote is found “…and the backfield, Esler, Macrorie, Verbeten, Kemp, Hishon, Kronforst and Ludke rightly earned the name of ‘Galloping Ghosts’ which some writer tacked on to Bill Smith’s ‘Pony Backs’ “. Coach Smith referred to his running backs as ”Galloping Ghosts” to instill that sense of competitive confidence and desire to win. It worked! His teams and Kaukauna’s subsequent football teams, as well as the basketball, baseball, track and boxing teams provided Kaukauna High School and the city with a wealth of ”Galloping Ghost” memorabilia. The phantom horse and rider virtually galloped into KHS tradition about 1940 when a student cloaked himself and his mount in bed sheets and thundered onto the football field to present the opening game ball to the referees.